From Monday 1 October 2018 until Thursday 31 October 2019: Enjoy 30 % off! From Monday 11 February 2019 until Tuesday 7 May 2019: Enjoy 35 % off! From Thursday 21 March 2019 until Thursday 31 October 2019: Enjoy 30 % off! From Thursday 21 March 2019 until Thursday 31 October 2019: Enjoy 25 % off! 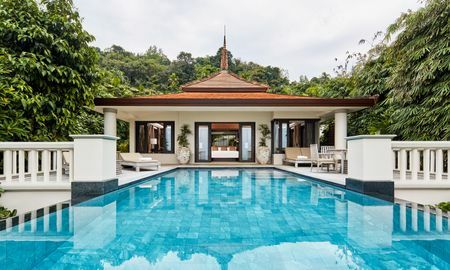 Among centuries-old ficus trees and fishtail palms, the Trisara hotel offers a unique experience on the island of Phuket. 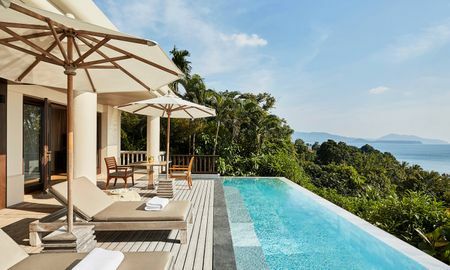 The intimate seclusion of private villas and residences sit on terraced, tropical hillsides and look straight out to the crisp blue Andaman Sea. Carefully choreographed within an elegant and refined environment, every room is outfitted with plush ergonomic furnishings replete with sumptuous amenities for a stay within a haven of pure contentment. 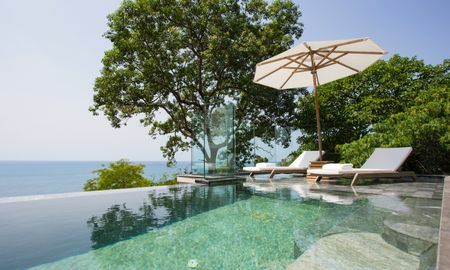 The private villas boast infinity pools with panoramic views of the Andaman Sea and the spectacular sunset, and designed within the luscious shade of artfully managed old-growth canopy, the generous spaces and rich interiors encourage moments of reflection and connection. 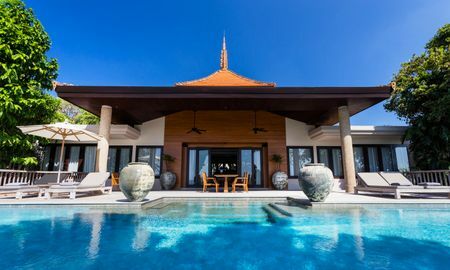 Trisara’s exquisite collection of residential pool villas embody the spirit of a serene, tropical paradise, as each private enclave is enclosed in natural gardens. Expansive suites, charming sea-facing verandas and extended swimming pools lend themselves to intimate gatherings in decadent surroundings. The hotel has three restaurants each offering heritage gourmet recipes using the freshest ingredients. Harvesting nature’s bounty, the talented team of culinary masters’ relish in bringing nourishment and pleasure to the plate. Savour inventive European cuisine or authentic Thai seafood in a relaxed, ocean-front setting. At The Deck, lean back with a flavourful cocktail and lite snack, enjoying the light tropical breezes and swaying palms. The Jara Spa presents a haven of tranquillity and well-being within the lush jungle and pure air. Using 100% natural Sodashi products based on essential oils and extracts from the Earth and ocean, various treatments, such as body wraps, facial scrubs and rejuvenating massages are available. Guests can take advantage of the well-equipped gym, compete on the tennis court, or between December and April, Trisara offers non-motorised water-sports, including snorkelling, kayaking, windsurfing and paddling. Supervised by qualified staff, a wide range of indoor and outdoor activities are offered at the Kids Club for children aged 4 to 16 years. 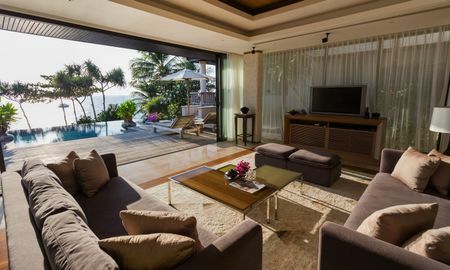 Trisara is situated on the seafront, in a private bay, on the northwest coast of Phuket. 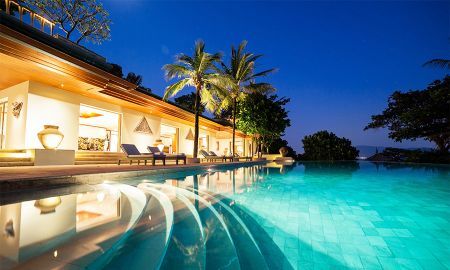 Surrounded by exotic gardens, the National Park, Layan Beach, Nai Thorn Beach and Laguna Phuket Golf Club are close by. 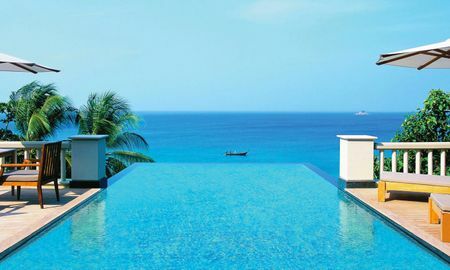 From the hotel, Kamala Beach and the centre of Phuket can be reached within a 50-minute drive away. Phuket International Airport is 10 km away.